Think wearable technologies like Google Glass is cool? 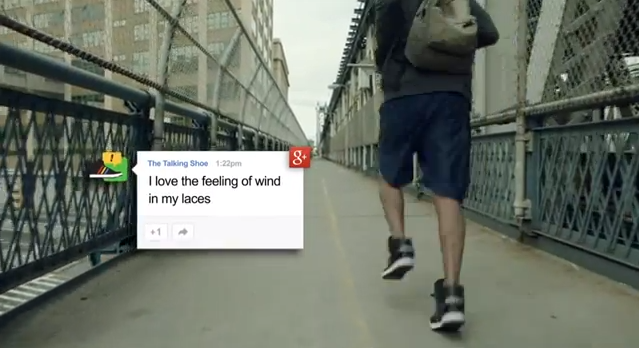 Well, Google is at it again, this time, showing off a pair of talking shoes at the ongoing South by Southwest (SXSW) conference in Austin, Texas. Working with other companies – YesYesNo, ad agency 72andSunny, and Adidas, the four attached a small computer to two Adidas tennis shoes along with an accelerometer, a gyroscope, Bluetooth and other technologies, the shoe is not only able to “talk” via a pair of built-in speakers, but also able to post activities to Google+. In case you’re wondering, no, the shoe will not be available for sale, not in the near future at least. It is just an experiment to be showed off at the on-going conference that features many tech-focused investors and pundits. Check out the video below to see a demo. Do you think the world is ready for a talking pair of shoes? I wonder how Google can make it work together with Glass. Comic Book Fans Rejoice! Marvel Is Giving Away 700 First Issue Digital Comics For Free!